Every enthusiast outdoorsman needs some specific tools that will ease his outdoor journey. And for challenging activities like hunting and an enjoyable task like bird watching, you will have to pack with the most important gears. I refer to monocular as one of the must-have tools for hunting and bird watching. Because monocular is handy, light-weight and compact resulting in achieving your target with more ease and success. So next time before going for hunting, make sure you have one from the best monocular for hunting. But finding the perfect monocular for hunting or bird watching may seem hard for someone, since there are lots of them in the market, each of them is built to fulfill a certain purpose. That’s I am writing this in-depth article on the top-notch monocular for hunting and bird watching with a helpful buying guideline. Let’s jump into it. 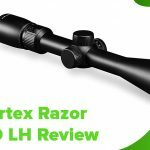 Best Monocular for Hunting & Bird Watching! Wingspan Explorer 12X50 monocular is the best choice for the hunters who are looking for bright clear image from their monocular with satisfying durability. And we consider this as the best monocular for hunting due to its affordable price, great magnification and clear field of view. You can also consider this if you are just looking for the best monocular for bird watching. While hunting you will need to bring the objects as much closer as you can. Wingspan Explorer is really outstanding for this purpose with its 12 times magnification through its 50 mm objective lens. And it’s evident that you will get the most pleasant and sharp view with this high magnification level. In fact, we refer to this Wingspan Explorer monocular perfect all types of necessity. This high powered monocular from Wingspan family is dedicated to facilitate you with great power, distance and clarity during day time. It has an ergonomic design to enable you to focus on the target fast and accurately with just a single hand. It is built with durable external armor to provide a secure, slip-free grip and durable protection. Wingspan is fog proof and waterproof. So, you can take it with you without worrying about the weather and the environment. The monocular is designed to inhibit internal fogging. For outdoor adventures like hunting and wildlife observing, it is really great to have a monocular that covers moderate to long distance. 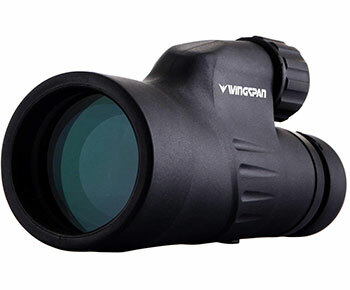 Now, this Wingspan monocular with its 12x magnification can provide crisp image up to 100 yards which are really satisfactory. This monocular is of the right size and weight to accompany you in your hunting and other adventures. Wingspan Explorer is sturdy and solid. It is one of the most powerful monocular and will definitely amaze you as soon as you unbox. It comes with a large viewing area with substantial magnification and clarity even in low light condition due to its BAK4 prism. BAK4 is a high-density glass that has better optical quality. But one thing to bear in mind that, it has daytime vision only. 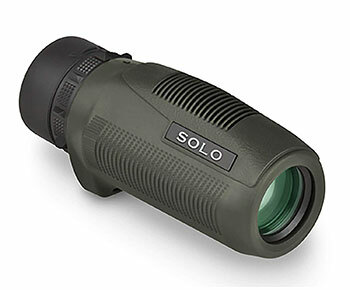 This monocular has 246 ft/1000 yds field of view and 14 mm eye relief. Its close focus is 2.5 m. The whole package includes nylon mesh carrying case, eyepiece and lens protection covers and non-abrasive, microfiber lens cleaning cloth. There is hardly any match for Wingspan Explorer. You will not regret after having so many features with a great affordable price. This monocular is best not only for hunting but also for all types of situation that demand monocular. You may wonder why this monocular is special with only 6x magnification while other monocular offers more magnification like 10, 12 or higher. Roxant claims, while using monocular handheld, more magnification is not always a better option. Because with higher magnification comes more shaking and jittering phenomena. So 6x magnification is ideal if you want a compact hand-held monocular. So, the choice is yours! In spite of having little less magnification, this Roxant authentic grip monocular performs greatly with its wide 30 mm objective lens. With this, you will experience your surroundings with crystal clear beauty. This monocular feature a retractable eyecup with offers satisfactory comfort for both people with glass and without glass. You will hardly find the same type of comfort with other monocular at this cheap price. 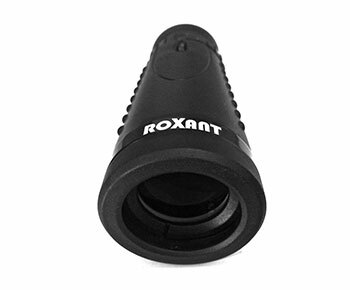 Like other high ends monocular, Roxant Rox-Gs features superior BAK4 green film prism and optics with premium multicoating which guarantees superior light transmission and brightness for an optimal crisp image. With this monocular, you will get access to a perfect combination of best functionality and comfort. It has a slip-free comfort molded grip enabling you to hold steady for a long time. You don’t have to buy additional carrying and maintenance accessories like belt loop or cleaning cloth. You will get carry pouch with belt loop, cleaning cloth and neck strap with the monocular. All these special accessories will help to carry this best compact monocular with you wherever you go and maintain the monocular perfectly for longer life. Vortex Solo 10X25 Monocular is a perfect choice for hunters to backpackers who want to have a great addition to their favorite gear list. This solo monocular provides quality viewing for outdoor enthusiasts especially for those who like to bring nature a bit closer. With 10x magnification and 25 mm objective lens, you can find your target with ease. This 4.4-inch-long monocular weighs 5.6 oz only. Therefore, it is very much lightweight, compact and really very easy to handle. This quality optic comes with fully multi-coated lenses increasing the light transmission and resolution. That means you will get clear and crisp images whenever you look through the monocular. Its focus wheel is very easy to access. You will find it on the eyepiece. To focus the distant objects, you have to turn the wheel clockwise and for nearer objects vice versa. Vortex Solo is fully rubber-armored which makes it really durable and you are getting a non-slip grip. You will just love this durable, dependable observation equipment. This clear optic is Nitrogen purged and o- ring sealed. Therefore, it is waterproof and fog proof and you will get shockproof performance in any environment. This high performance monocular has adjustable eyecup which allows comfortable viewing with or without glasses. It has 6 degrees angular field of view, 315 feet/1000yards linear field of view, eye relief of 14.5 mm, exit pupil of 2.5 mm and close focus of 16.4 feet. All these features make this monocular very handy to carry and use. Its roof prism brings an additional dimension to greater durability and compactness. It will give you great eye relief whether you wear glasses or not. You will get additional accessories like lanyard and carrying case. The lanyard enables you to carry and bring the monocular with you and the carrying case protects the monocular when not in use. This Gosky Titan Monocular is unique with its quick smartphone holder. When you are out there for amazing adventures, you will want to capture some breath-taking moments to share later with your near and dear ones. This Titan monocular was designed in 2017 accordingly to serve that purpose perfectly. It is light-weight, compact and really very easy to handle. 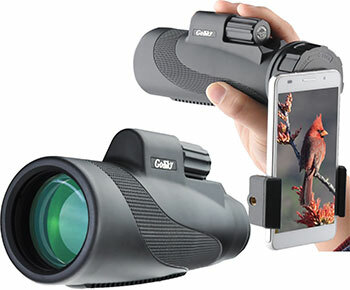 This monocular is compatible with almost all the prominent smartphones on the market. While taking pictures with monocular one should try to avoid vibration as much as possible. Camera shutter wire control comes handy in this place or one can use the voice control option of the smartphone and mount it on a tripod. This Gosky Titan Monocular has high power 12x magnification to accompany you while you are on climbing, hiking, driving and observing wildlife. This monocular has 45% more area have more light in with its 50mm objective lens which is really great than other objective lenses. Not only that, the FMC green film objective lens is fully multi-coated and has large BAK4 prims inside which strengthens its key function and guarantees superior light transmission and brightness. All that means you will get brighter, clearer images most of the time. 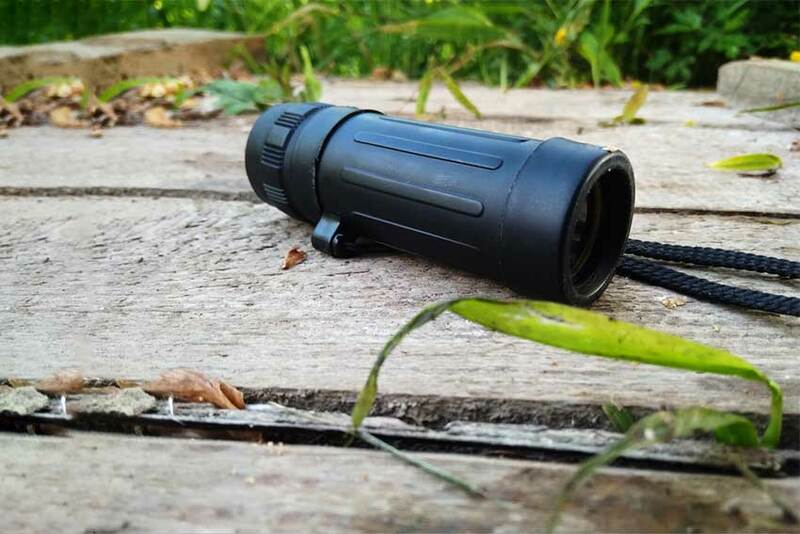 The monocular is completely sealed and 100% Nitrogen filled, therefore it is fog and rainproof, prevents harmful elements like dust, debris, and moisture to get in the monocular. All these features make the Gosky Titan monocular extreme durable. Its rubber armor extends the durability and results in a comfortable grip for use and ensures slip-free movement. The durable framework of the monocular ensures long term usability even in rough weather and the adjustable eyecup assures best user experience with or without glasses. The monocular comes with center focus system, has 289ft/1000yards field of view, 6.5-degree field of angle, exit pupil of 4.2 mm, exit relief of 17 mm and has a weight of 13.85 oz. The package includes smartphone adapter, carrying bag, eyepiece and lens protection covers, cleaning cloth and straps. It has tripod threads hole at the bottom. Our final pick is the Bushnell Legend 10×42 Monocular. This top-notch monocular is expensive but worth it. You will be overwhelmed with its features and performance. This monocular is one of the best hunting monocular from the Bushnell family. It delivers bright, crisp image with 10x magnification and large 42 mm objective lens. Bushnell Legend Ultra HD monocular is exceptionally built with highly performing BAK4 prisms and fully multi-coated optics. And they are accompanied by ED prime glass and PC-3 phase Coated prism. In short, this monocular is dedicatedly designed to make your adventures easier and more comfortable and provide with the best experience possible. It is amazing and renders the image with great clarity, detail and color quality. This is one of the most powerful monocular in the world and comes with a comfortably adjustable eyecup that suits for people with glass or without glass. Additionally, the eyecup includes Picatinny rail and carry clip. The front lens cap is just great while the rear one is sturdy. It feels great and very easy to focus with one hand. Actually, you will get what you pay for. 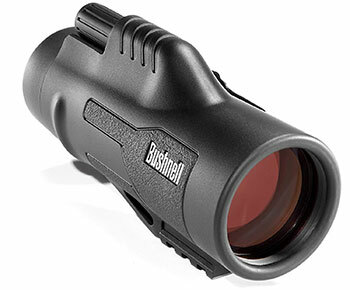 The Bushnell Legend monocular has 340 ft/1000 yards field of view, 6.5-degree angle of view, 15 mm of eye relief, 4.2 mm of exit pupil and it weighs 13.2 oz. The rubber armor secures the monocular from harm, makes it shock resistant and gives you a comfortable slip-free grip. The monocular is O-ring sealed and Nitrogen purged. In another word, it is water and fog proof. It also features lightweight magnesium chassis. The package includes lens cleaning wiper, sling and carrying bag. If budget is not a problem for you, you should give it a shot. It is better to have a pricey brand item that will accompany you longer than having a budget item that you have to leave after a while. 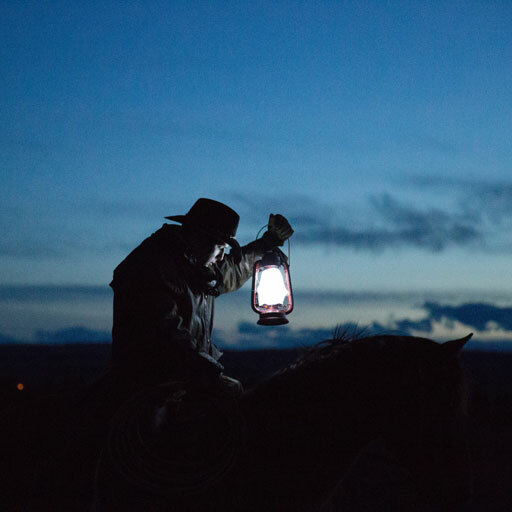 While you are out there for hunting like adventurous and challenging task, you need to prepare carefully. And before buying any gear you need to know which gear serves best for your requirement. In some cases, only knowing the requirement is not enough since one will find many types of the same optics. We have already mentioned the best monocular for hunting. Now it is time to know the key factors of a monocular that matter most. In fact, those features are the ones to make a specific monocular win or lose a situation. You may wonder why you should always prefer monocular to any other optics while hunting. Well, you can go for any other optics than monocular as long as you are pretty sure about your necessity and how to fulfill them. Hunting is very adventurous and challenging. Sometimes you have to wait for the right moment while you have to take a quick decision on a sudden situation, sometimes you are on the move for your desired target. I believe all those situations need to be faced and handled perfectly and with confidence if you want to reach your goal. And you cannot burden yourself with binoculars, tripod scopes or other large optics in a tough and challenging condition. You need a light-weight, compact and easy-going tool and it’s just great if you can handle the tool with a single hand. Here monocular comes into play. Monocular comes handy for hunting, backpacking, hiking and in all the cases where you need a compact optic. Keep in mind that, nobody can force you to use monocular only. You pick anything according to your free will! Make sure you know what you are doing before jumping into final decision. The higher the magnification the more distant you will cover easily. In the market, there are monocular that offer 6x magnification, while others will cover more magnification like 10, 12 or more. So, which one is good for you? Although higher magnification is preferred in general there is a key factor to decide. With more magnification, it will create more shaking and jittering effect while you are using them handheld or moving. So, if you have to move a lot and hunt then go for a limited magnification otherwise stick to higher magnification. Generally, a monocular selection also depends on the type of prey. A monocular for squirrel hunting may not be a good option for bird watching or wildlife observing. In easy terms, the objective lens defines the area for light to come in. Therefore, more area will have more light and you will get a better image. So, it is better to have a monocular with a large objective lens. In general, monocular with higher magnification comes with a large objective lens. While you are out there, every gram of weight matters a lot for you. In the market, you will find monocular weighing from 5 oz to 14 oz. If you carry a high quality monocular, it is evident to carry a little bit more weight than normal quality monocular. Prism is one of the vital and most basic parts of a monocular. There are three types of prisms and they are porro prism, roof prism, and Galilean prism. Porro prisms are of classic types and widely used, cheaper than roof prism. They are wide hinge ocular in shape and can be used for the regular type of watching like watching birds, seeing something from a small distance. In general, they are not waterproof. Roof prisms are costly and built for heavy duty. They have narrower hinge than the previous type and high magnification power. Their durability is great. This type of prisms is the most general, have a magnification between 2x to 3.5x. They are largely used in dental works. What is BAK4 prism by the way? On the other hand, low-end binoculars and monocular use BK-7 prisms which also provide satisfactory images but quite inferior to BAK4 output. So, whenever you are going to buy binoculars or monocular, try to avail the optic that comes with a better prism. Lens coating is a very important fact to consider before buying any optics. Most of the monocular comes with various types of lens coating. There are four types of lens coating. FMC is fully multi-coated and the best coating among all types. This coating assures maximum brightness and therefore, offers the best output. That’ why, it is expensive. If you want the best item with durability, then this type of coating is for you. If you want satisfying best result within a less price than the previous type, this one is for you. The multicoated lens also performs great, but not as same as the FMC coating. For regular use, you can choose this type without any confusion. The fully Coated lens has a single layer coating and for this reason, they provide fewer clear images. You will not get the best result with this lens. In general, viewing is not enjoyable through this lens. Regular Coated lens is the cheapest one. Their performance is very poor and we don’t recommend anyone to buy this. Eye relief defines the length of the focal point from the monocular. Say, you have a monocular with eye relief x. That means you have to place your monocular x distance away from the eye. For those who wear glasses should go for greater eye relief so that glasses don’t come within the distance. While you are out there, the weather has no guarantee. If may start raining without any notice or get gloomy very soon. Therefore, you should buy monocular that is weatherproof. And if you want to see at night through the monocular, you should go for night vision options. In this article, we have only covered the regular ones that will help you hunting perfectly and watching birds easily. So, they only cover the day times. Night time devices cost much. We will cover them in another article. Outdoor enthusiasts cannot stay home idle. They are just always ready to go and explore. Same goes for hunters. Keeping them in mind, we have reviewed the best monocular for hunting. 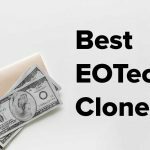 We hope newbies will find this article and buying guide as their starting point, while the experienced one will definitely find something new. Happy hunting!